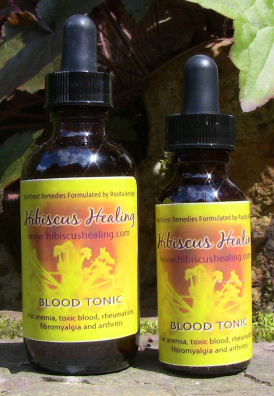 "Rheumatism, arthritis, rheumatoid arthritis, anemia, fatigue, gout, toxic blood, inflammation, allergic reactions, and fibromyalgia," from Rosita Arvigo's Ethnobotony of Belize. These two herbs focus on the blood. It can help with anemia because it is a plant source of iron. It also cleans toxic blood, which plays a role in diseases such as rheumatism, fibromyalgia, and arthritis. *Not to be taken in early pregnancy, but safe after 20 weeks. Safe while nursing. Suitable for pets with arthritis. May react with birth control products. China Root and Wild Yam.